No matter how long you have lived in Cardiff, it is easy to see that it rains quite frequently! I am one of many students who have experienced walking to and from University getting absolutely drenched. During my first few months of University I decided that enough was enough and I had to invest in a decent waterproof coat and pair of boots. Other students decide to bring their cars to University, which is incredibly handy when the weather makes a turn for the worse. The weather can easily influence our mood and a miserable rainy day or week can bring us down. Cardiff University Student Support is here to provide help and assistance to students, whatever their worry and regardless of the weather! We encourage students to access the support available to you throughout your University life and would like to ensure that all students know about and make use of our services when they need them. Please help us spread the word at Cardiff University and take part in our umbrella initiative. 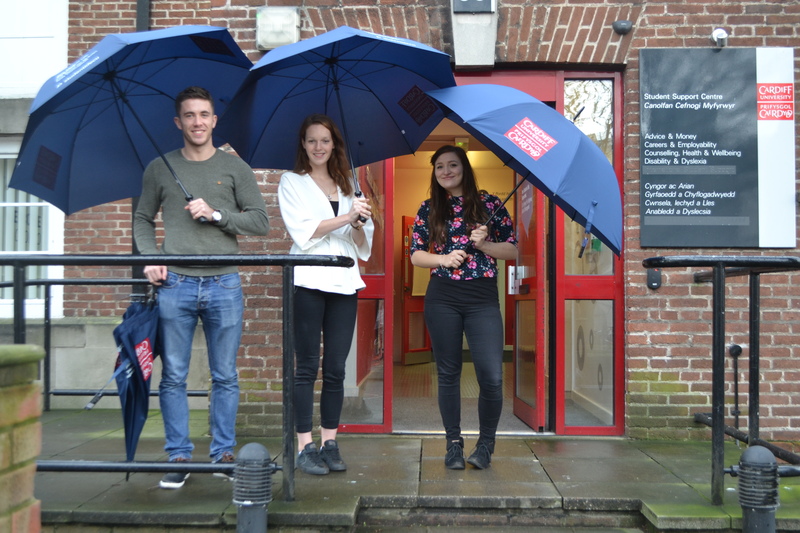 We are running a competition for Cardiff University students to win one of our Cardiff University Student Support umbrellas – to help fight against the often relentless welsh weather and make your travels across campus a lot easier. We have 35 umbrellas to give away, so plenty up for grabs! This initiative is for Cardiff University students only. We’ll select students at random and notify the lucky winners via social media and their University email address. International Student Support Guidance and information, Immigrations Advice, Support with Tier 4 Visa Applications, Appointments and Drop-ins. Drop-in and see us soon, we are open weekdays all year round (closure days are noted on the intranet, facebook and twitter). Follow this blog and our social media accounts Facebook, twitter and youtube to find out more about how we can support your student life and make your time at Cardiff the best it can be. The Student Support Centre has a range of services dedicated to helping students make the most of their time at University, including: Advice & Money, Careers & Employability, Counselling, Health & Wellbeing, Disability & Dyslexia and International Student Support.The Student Support Centres are located at 50 Park Place, Cathays Campus and Cardigan House, Heath Park Campus.